"Do you think I like being the Count of Monte Cristo? He's a dreadful man, pitiless and cold. I didn't want to become that man. I was happy just being Edmond Dantes." The literary works of Alexandre Dumas have proven to be very popular subjects for films and television over the years. The Three Musketeers in particular has been brought to the screen some 28 times, with additional versions made for television. Not nearly as overdone, but equally worthy of attention, is The Count of Monte Cristo, Dumas' classic story of love and revenge. It's been done several times on film and for television, too, but never in a production that allowed for full development of the novel, with most versions running under two hours. Coming closest was a 1964 BBC series, which ran for 26 episodes and covered nearly all of the novel, but that version is impossible to find on video (I haven't seen it myself, but it is supposed to be a very faithful adaptation). Luckily, in 1998, the cable channel Bravo Network produced a six-and-a-half hour miniseries that follows the story pretty faithfully, and has excellent production values to boot. 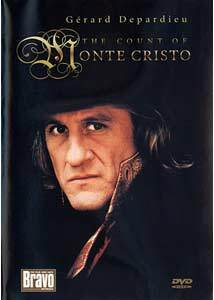 Gerard Depardieu plays Edmond Dantes, eventually known as the titular Count. Those of you who took high school English are probably familiar with the plot: Dantes is an inconsequential French sailor falsely accused of political treachery and jailed for 18 years without a trial. After escaping, with the help of an aged fellow inmate, he locates (using clues his old compatriot provided before his death) a colossal fortune of gold and jewels. Transformed by his years in prison and hell-bent on revenge, he uses the money to fashion himself a new identity. He becomes the Count of Monte Cristo, and quickly integrates himself into the elite French society, all the while working to bring down the men who imprisoned him. The six-hour running time certainly allows for a bit of breathing room in adapting the longish novel. Presented as four hour-and-a-half movies, each entirely in French with English subtitles, it ends up (for this mono-linguist) feeling quite a bit like re-reading the novel. Most versions gloss over much of the complexity of the Dantes character, oversimplifying his schemes of revenge. Presented in this format, the political intrigues and clever deceptions are allowed to build, and gain real emotional resonance, something not possible in a two-hour adaptation. The cast is excellent for the most part. Depardieu seems born to play the Count. In one of his subtler performances, he captures the sad ferocity of the man; the ultimate anti-hero consumed by hate and despair, a man who has traded a literal imprisonment for imprisonment in his hatred. Florence Darel, as the Count's love interest Camille, is good, but perhaps a bit to modern, in her role. The villainous trio responsible for the Dantes' imprisonment, Villefort, Mourcef, and Danglars, played respectively by Arditi, Rochefort, and Engelbrecht, are able to create real characters, rather than simple one-dimensional foils. The real strong point of the piece is the wonderful production design, from Richard Cunin. The lavish production at no point looks like something created on a television budget. Both city streets and interior sets feel realistic but not overly dressed and showy. The script, for Didier Decoin, is an excellent adaptation, full of striking, memorable dialogue, and is directed with flair by Dayan, a French television director—visually, things are never dull. Admittedly, the series has a rocky start, with the scenes of Dantes imprisonment covered rather hastily, but once the Count reveals himself, things settle into a compelling series of intrigues that eventually build to a mesmerizing portrait of a man so consumed by revenge that he ceases to live the life he's so angered to have lost. Image Transfer Review: It appears this production was shot on video, and sometimes the rather dull color palate doesn't do justice to the sumptuous production design. Blacks are likewise a bit weak, with only fair shadow detail keeping things looking a bit murky in darker scenes. The discs are rather packed (over three hours of material on each), and they show some compression artifacts here and there. There's also an overall softness to the image. All that being said, this is a good looking presentation considering the source materials, and it no doubt looks far better than it did on television. Audio Transfer Review: This is a dialogue-driven piece, and speech is thankfully well presented. Dialogue is always well integrated with the score, and sounds strong enough (though it is difficult for me to judge things like ADR when everything is in French). The score fills out the mix, but suffers a bit from a lack of low-end, becoming harsh and overpowering at times. Fine for what it is, but not a very impressive track. Extras Review: Extras are fairly limited. There's one TV spot, some brief production notes, filmographies, and a screen of cast and crew credits. The episode summaries are useless unless you want the story ruined for you beforehand. This year, yet another version of The Count of Monte Cristo is coming to theaters (the fifth theatrical take on the story in 85 years), a big-budgeted production from Buena Vista. It's hard to imagine any slick, two hour, Hollywood retelling of this classic could be more compelling or well acted than this French mini-series. Definitely worth a look for fans of long historical dramas.